This PDF 1.3 document has been generated by XPP / StampPDF Batch 2.7 for Solaris - SPDF 1045, and has been sent on pdf-archive.com on 08/07/2016 at 06:15, from IP address 76.167.x.x. The current document download page has been viewed 517 times. File size: 267 KB (7 pages). were not associated with levels of household firearm ownership. equally lethal suicide acts, such as jumping off tall buildings. 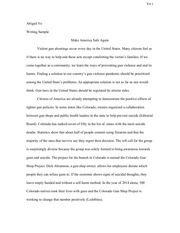 Submitted for publication August 31, 2005. Accepted for publication November 16, 2005. Copyright © 2007 by Lippincott Williams &amp; Wilkins, Inc.
From the Harvard School of Public Health, Boston, MA. only for the gun owners but for all members of the household. respondents living in households with children. and age (5–19, 20 –34, 35– 64, and 65 years of age and older). questionnaires and data are available on the Internet (www. refused to answer the BRFSS firearm questions. individuals live in households with firearms). youngest age group (5–19 years). women and for our youngest age group. ownership are associated with higher rates of overall suicide. Massachusetts, Rhode Island, New Jersey, Connecticut, and New York. United States would decrease by approximately 1,700 suicides per year. for suicidal tendencies, such as suicidal plans or attempts. where mortality data are aggregated from 2000 to 2002.
likely, suicidal acts are, on average, less likely to prove lethal. means affects the rate of completed suicide. ncipc/wisqars. Accessed April 12, 2005.
review. Washington, DC: The National Academies Press, 2005.
suicidal inpatients. Arch Gen Psychiatry. 1988;45:581–588. case-control study. JAMA. 1991;266:2989 –2995. adolescents: a case-control study. J Affect Disord. 1994;31:193–202. relation to gun ownership. N Engl J Med. 1992;327:467– 472. Rushforth NP. Risk factors for violent death of women in the home. abuse: a case-control study. Acta Psychiatr Scand. 1993;88:403– 408.
homicide or suicide. Am J Public Health. 1997;87:974 –978. 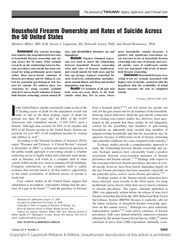 Wintemute GJ, Parham CA, Beaumont JJ, Wright M, Drake C.
Mortality among recent purchasers of handguns. N Engl J Med. States. Am J Public Health. 1984;74:123–127. rates of homicide and suicide. Can Med Assoc J;148:1721–1725. areas. N Engl J Med. 1990;322:369 –373. suicide rates in the United States. Epidemiology. 2002;13:517–524. Davis JA, Smith TW. General Social Surveys (GSS), 1972–2002. Storrs, CT: The Roper Center for Public Opinion Research; 2004.
northeast. J Trauma. 2004;57:626 – 632. 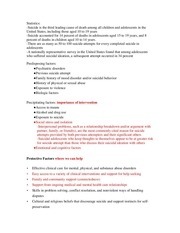 Behavioral Risk Factor Surveillance System, 2001 survey data. Section. Washington, DC: American Statistical Association. 1999. Bureau of Labor Statistics. Unemployment Rates for States, 2001. US Bureau of the Census. Census 2000 Summary Files 1 and 3. Available at: http://factfinder.census.gov/. Accessed June 10, 2004. Kellermann AL, Fuqua-Whitley DS, Sampson TR, Lindenmann W.
Public opinion about guns in the home. Inj Prev. 2000;6:189 –194. replication. Psychol Rep. 1991;69:149 –150. Wilkinson KP, Israel GD. Suicide and rurality in urban society. Suicide Life Threat Behav. 1984;14:187–200. a correlate of suicidal behavior in adolescent psychiatric inpatients. 1960 –71. Br J Prev Soc Med. 1976;30:86 –93. ownership: measurement, structure, and trends. J Quant Criminol. Piantadosi S. Invited commentary: ecologic biases. Am J Epidemiol. overdose) and rarely make it to the hospital for treatment. that also demonstrate the association at the individual level. My 35-year-old patient was one of the few to survive. Minos Tyllianakis, PhD, Panagiotis Dimakopoulos, PhD, and Elias E Lambiris, PhD. This file has been shared by a user of PDF Archive. Document ID: 00398434.